I still remember my first snow-day, six years ago. I came to the East Coast from Northern California where weather-related days off of school are unheard of. Waking up in the morning of a Tuesday or Wednesday to a pristine snowy tableau, a breakfast of pancakes and a whole day of reading stretching before me was pretty awesome, especially for a native Californian. Now, with the kiddos, snow days are more full of snowmen and Go Fish, but don’t worry – there are still pancakes! 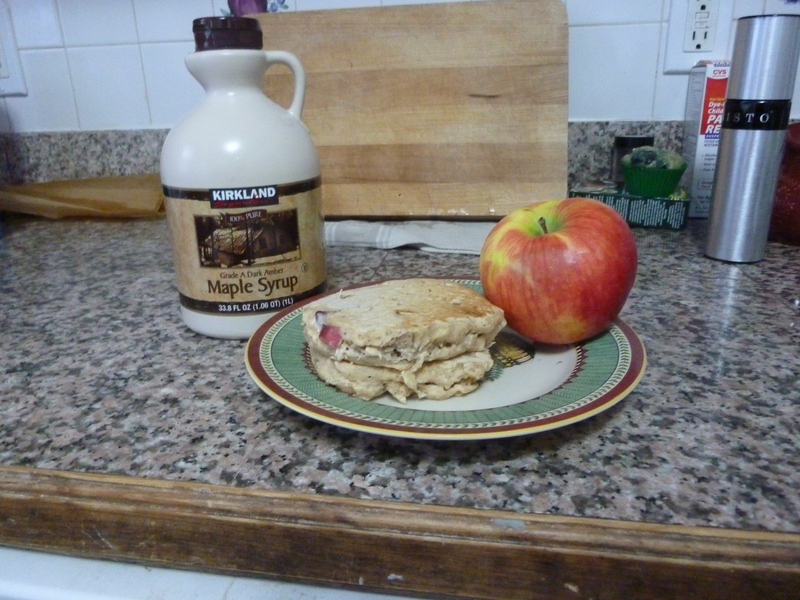 This morning we decided to make some Oatmeal-Apple Pancakes using the apples from last weekends Farmer’s Market. This is a recipe I’ve been tweaking for a while, and the pancakes today came out beautifully! I think I finally got the right ratio of flour, oats and liquid to make tasty, but not raw, oatmeal pancakes. So, think of these goodies next time the snow starts piling up – or when you just want a yummy maple-syrup topped breakfast! 1) In a medium bowl, soak oats and 1 cup milk for 5-10 min. While the oats are soaking, mix the flours, baking powder and cinnamon in a separate bowl. 3) Stir in flour, cinnamon and baking powder, making sure to fully incorporate. You don’t have to worry about over-mixing as much as you do with regular pancakes because the oats and the whole wheat flour can take it. 4) Pour 1/3 cup of batter on a hot griddle. When you see bubbles on the sides (about 2-3 minutes) flip the pancake. Push down with your spatula to spread the second side a little. Then, cook for another 2-3 minutes. Serve with warm maple syrup!